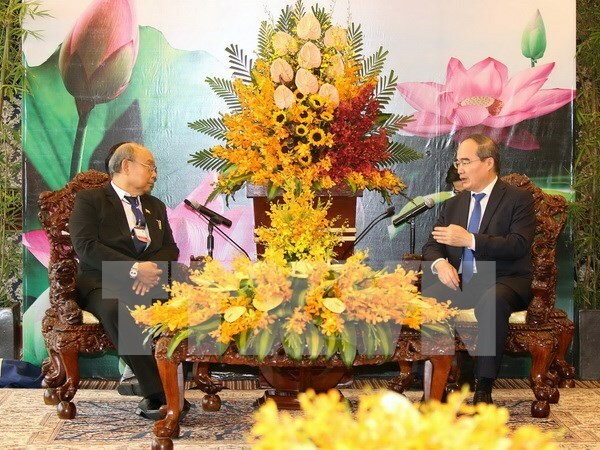 HCM City (VNA) – HCM City wants to increase the two-way trade value with Myanmar, said Secretary of the city’s Party Committee Nguyen Thien Nhan at his meeting with Mahn Win Khaing Than, Speaker of Myanmar’s House of Nationalities and Parliament, on May 11. Speaking at the meeting, Nhan spoke highly of the traditional relations between Vietnam, including HCM City, and Myanmar, and the two sides’ similarities in culture and religion. He underlined that trade ties between the two countries have made progress for the benefit of their people. The secretary noted that the city annually held a trade fair in Myanmar’s capital city Yangon while many tour operators from Myanmar joined the city’s tourism fairs. He thanked Myanmar for facilitating Vietnamese businesses’ operation in the country and reiterated that HCM City looks forward to enhancing cooperation with Myanmar with the emphasis on promoting trade and investment and raising trade value. For his part, Mahn Win Khaing Than lauded the robust development of HCM City, saying that Myanmar looks to learn from Vietnam’s experience in national protection and building.